One of the first things a Toronto wedding photographer should learn is that the bride shoes are extremely important for her. In fact, after my first wedding my wife, my biggest critic and supporter told me to never ever come home without gorgeous photographs of the bride's shoes. That stuck with me for the rest of my career as a professional wedding photographer. The truth is that sometimes you simply have no time to take a great photos of the shoes so one of my secrets is to have a go to photograph that I can pull off even under severe time constraints on the wedding day. Often, of the big day things don't run according to the plan and everybody panics, from the bride and groom to the bridesmaids, the guests and so on. If would take me a lifetime to share with you all the stories I heard or experienced, stories that could ruin couples' special day. From receiving the wrong cake to ruined wedding dresses to lost wedding bands, I have seen it all. At this wedding at Liberty Grand it was the hair and makeup that ran late. Between you and me, that is one of the most common causes of delays on the wedding day. 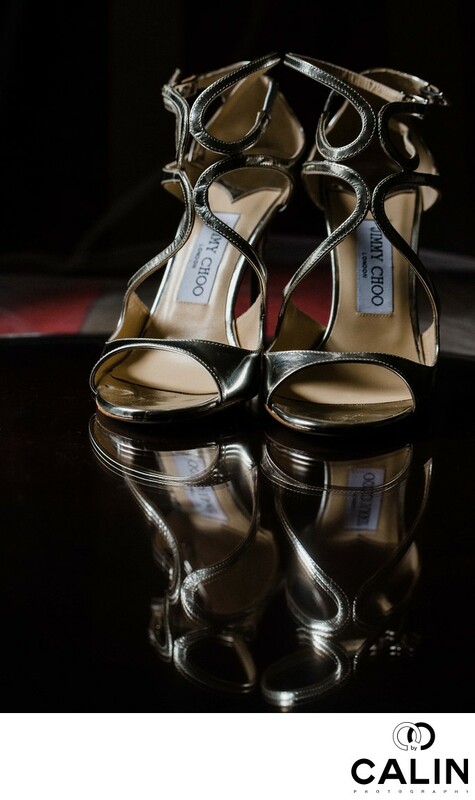 Regardless of that, I knew that I had to create beautiful images for the couple and the photograph of the Jimmy Choo shoes was extremely important. Now let me tell you that it was very difficult to find a clean spot were to photograph the shoes as the large bridal party was occupying the whole room. Again, in wedding photography there are no excuses! You either deliver great photographs or you won't be successful as a wedding photographer in Toronto. After all your future clients don't know the circumstances under which you photograph. With the see is the final result and that is what matters. That is the reason why all I said photographers want to enter the wedding photography arena failed because some that you have only a few moments to create a beautiful image of a shoe for example. As expected, without a lot of experience the newbie fails miserably. To make it as a professional photographer, an artist needs at least three traits: first, to be able to create under severe pressure. Second, to be persistent and third to be a quick learner. I remember like it was yesterday how I botched a family portrait session. I hate myself for that but I learned fast how to take proper group photographs. In fact, I would say that my mistakes pushed my business more than my successes. For sure there were moments when I was ready to give up and here is where persistence came into play. That is why I strongly recommend that the new artists in the GTA practice, practice, and then practice some more, shoot free engagement sessions and work for free before they call themselves professional wedding photographers. Saturday, I noticed a tendency among my colleagues not to practice or study after they become fairly successful. In my opinion, that is a big mistake negatively impact their business. With the acceleration of the rate of innovation and with the free and easy access to information, it is even more important to learn new techniques so that the wedding photographer in Toronto stays ahead of the curve. Yes you will say their 30,000 couples getting married every year in the GTA. I agree! But for the 30,000 marriages there are probably at least as many photographers if not more. Just ask your friends and you will see that everybody knows at least two or three professional photographers in the greater Toronto area. If 20 years ago knowing how to get a correct exposure brought you enough business so that you could make a comfortable living, today that is not enough. You need to be a social media guru, and as your expert, a blogger aficionado, an excellent retoucher, wedding album designer and more to be successful in such a competitive marketplace. I can definitely go on and on about the morale of the story is that the wedding day is a fast-paced and unpredictable animal and the professional photographer has to be able to juggle many balls to be successful in this industry. One of them is to be able to create beautiful photographs of wedding details under severe time constraints.